Picking a bat is kind of like picking a blog. Sometimes the other ones have more hits. Happy Holidays. I’d like to take this opportunity to re-introduce MLB.com Blogs Central, the community blog for MLB.com and MLB.com/blogs. 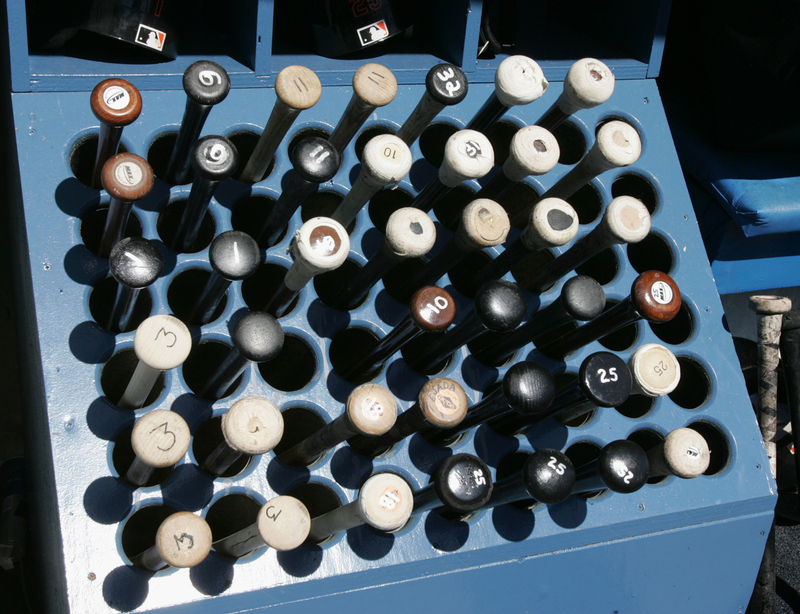 When you see the new array of bats in the custom theme here, just think of approaching a batrack in a dugout and the fabulous choices at your fingertips. That represents the array of choices you should find as a regular right here. As you’ve probably noticed lately, we’re now using this blog to highlight much of the excellent, topical content around here with Reblogs of select posts from both MLB PRO and FAN blog themes. We’ll showcase some deserving blogs in this community much more dynamically — in real time as opposed to just once a month. It’s a great way to stay on top of what’s happening around baseball while discovering some quality blogs and growing your own. So first of all, make sure you’re Following this blog. If you are logged in, you should have a Follow option in the top toolbar. We also recommend subscribing to our email updates via the button in the widget to the right so you don’t miss a thing. Posts from here will naturally become more frequent as a result, and I’ll no longer compile Latest Leaders rankings. If you come across a blog post you think is outstanding or have a post of your own that you’re particularly proud of, by all means please leave a comment here and make sure to include the Permalink URL so others can find you. (Just don’t list your own blog here every single post, though, or your commenting would be treated as spam and require subsequent approval.) And definitely continue to use your community blog as you have all these years, whether you are a rookie blogger saying hello with an introduction or a veteran interacting with longtime friends. April will mark the 10th anniversary of the best baseball blogging community here at MLB.com/blogs, a place where we at Major League Baseball Advanced Media partner with our friends at WordPress.com to provide the most cutting-edge blogging software anywhere. We hope you will find this community blog helpful to your discovery of other bloggers and in surfacing cool posts, as part of the total MLB.com experience. A good blog is kind of like one of the bats in this picture — a trusted companion, but you still want to try some others out. You may have noticed a recent increase in spam comments in our community. WordPress.com has confirmed an uptick in spam activity and asks everyone to help the anti-spam effort by marking any spam messages in your blogs as such. You can do this in your dashboard, under Comments. The Akismet system that identifies and removes spam from the system uses an automated learning process, so every successful identification of a spam comment makes the system smarter. If you haven’t already done so, we recommend installing the free WordPress.com app on your mobile device. You can receive notifications of new comments and conveniently mark comments as spam in the app. These are some of the latest PRO posts within the Major League Baseball family. If you have a post of your own you want to feature, make sure to leave a link in the comments below. Todd Zolecki discusses Dave Montgomery’s comments on Ruben Amaro Jr.’s job security. TribeVibe posted photos and video of the Indians’ Ice Bucket Challenge to fight ALS. The SNY broadcasters took the Ice Bucket Challenge and Anthony DiComo has the video. Jack O’Connell explains at The Cutoff Man how a scoring decision changed historic hits. Rays Radio documents Ben Zobrist’s Wednesday visit to All-Children’s Hospital in St. Pete. Dodger Insider explores Carl Crawford’s dramatic hot-and-cold streakiness this season. John & Cait share stories and images from Derek’s Day at Miller Park on Wednesday. Curly W Live previews a feature on Anthony Rendon from the latest Nationals Magazine. The Mariners hosted a PLAY event and From the Corner of Edgar & Dave has the details. Alden Gonzalez discusses Mike Scioscia’s decision to sit Josh Hamilton a second night. Ian Browne writes about the Red Sox sending Jackie Bradley Jr. back to Triple-A Pawtucket. Dodger Insider examines the difficulty of the remaining schedule and whether it matters. Comerica Park, 48201 has video of several Tigers taking the Ice Bucket Challenge. Twinsiders announced an Instagram photo contest for fans to win an autographed ball. Greg Johns reports the Mariners are shuffling the rotation to pitch Hisashi Iwakuma in Boston. Vine Line Blog has an article from the August issue on Anthony Rizzo’s improved hitting. TribeVibe was there when Jason Kipnis surprised a local fan with tickets and a visit to BP. John & Cait ask fans to bring school supplies to donate at Miller Park this weekend. Friar Wire sees Yonder Alonso’s career at a crossroads after injuries clouded his future. SF Giants Photos shares a gallery of images from Junior Giants Day at AT&T Park. MLB.com Fantasy 411 breaks down the fantasy impact of the Trade Deadline deals. Former MLB scout Bernie Pleskoff shares his thoughts on the Trade Deadline activity. Bryan Hoch dissects the anatomy of a rare trade between the Yankees and Red Sox. Beat writer Jason Beck explains how the Tigers pulled off a stunning deadline deal. Ian Browne recaps an eventful period before the Trade Deadline for GM Ben Cherington. The Phillies stood pat on Deadline day and Todd Zolecki has quotes from Ruben Amaro. Beat writer Jennifer Langosch wraps up a very lively couple of days for the Cardinals. Dodger Insider previews the August edition of the magazine with cover boy Hyun-Jin Ryu. 1 Citizens Bank Way offers five reasons you need to be at the ballpark for Alumni Weekend. The teen blogger at Baseball with Matt breaks down some recent trades around baseball. At the Trade Deadline blog, Todd Zolecki says not to expect Cole Hamels to go anywhere. Beat writer Joe Frisaro argues that the Marlins should consider bringing back Josh Beckett. Dodger Insider shares video of Vin Scully discussing his return for a 66th season in 2015. Vine Line Blog highlights Cubs catcher John Baker picking up the win as a relief pitcher. Jennifer Langosch breaks down the Cardinals’ deal for starting pitcher Justin Masterson. Better Off Red shows Ultimate Sports Doubleheader posters with the Reds and Bengals. Friar Wire says Tyson Ross is having one of the best months ever by a Padres pitcher. Twintern Adam Van Clay details a humorous email mistake that continues to haunt him. SF Giants Photos posted a gallery of photos from Law Enforcement Night at AT&T Park.